Well, the makers of the film have finally locked the release date. Actress Jyotika has an amazing line up of films this year- Mani Ratnam’s Chekka Chivantha Vaanam, Radha Mohan’s remake of Tumhari Sulu- ‘Kaatrin Mozhi’. There’s a lot of buzz around the Tamil remake of Tumhari Sulu. The film will see Jyothika playing the lead role of Vidya Balan. Well, the makers of the film are quite happy and impressed by Jyothika as she has wrapped up the shooting of the film in one schedule, without any break. Well, the makers of the film have finally locked the release date. Interestingly, the film is releasing on Jyothika’s birthday i.e. on October 18. Meanwhile, on the occasion of her last day of the shoot with the team, Jyotika surprised by gifting from her side a silk saree and silk (dhothi) veshti and shirt to all the crew members and took photos with them. She also presented a special gift to all assistant directors for their fantastic work. The entire crew was delighted with her kind gesture. 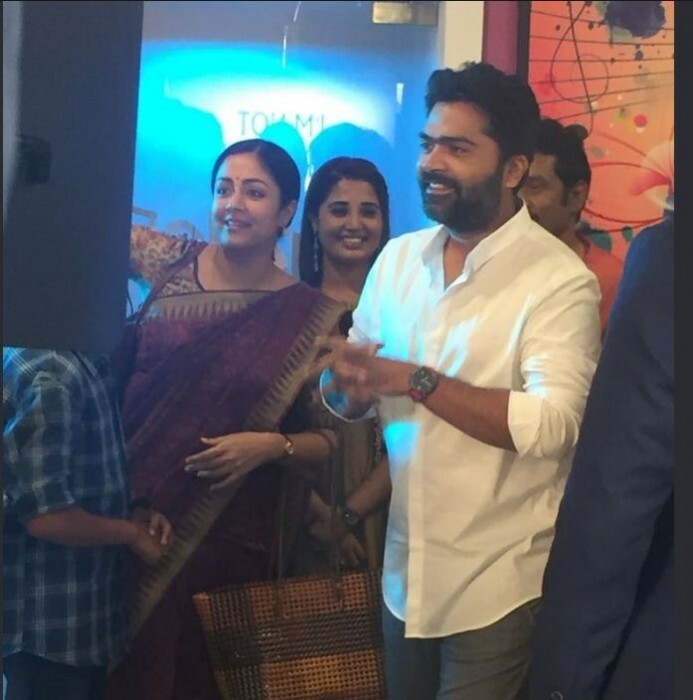 During the cake cutting event on 25th July night, Jyotika mentioned excitedly that this was the best team she worked in her career and thanked everyone for the tremendous work and enabling the experience of working in this film a pleasant and enjoyable one for her. Both the Director Radhamohan and Producer G. Dhananjayan thanked her for the wonderful involvement and support in wrapping up her portions of the film in a single schedule. Tumhari Sulu remake Kaatrin Mozhi is being directed by Radha Mohan. Kaatrin Mozhi also stars Telugu actor-producer Lakshmi Manchu. She will be seen stepping into Neha Dhupia’s shoes from the original while Jyotika plays the role of Vidya Balan. Produced by Dhananjayan Govind’s BOFTA Media Works, Vidharth plays Jyothika’s husband and will reprise Manav Kaul’s role in the remake. The title Kaatrin Mozhi is taken from one of the most popular songs from the 2007 film.